From the disease that is rampant – those stories we’ve read. Who are raising these orphans, their future to save. From our bounty we grandmothers will lovingly share. When we all work together, we know we’ll succeed. Three years have gone by and look how we’ve grown! In thirty six months we’ve made our cause known. To those African grandmas from each fundraising event. Help, through the pandemic so the children can live. And free education should all children receive. And become leaders, tomorrow, with names that are known. An Africa strong, where women are free! 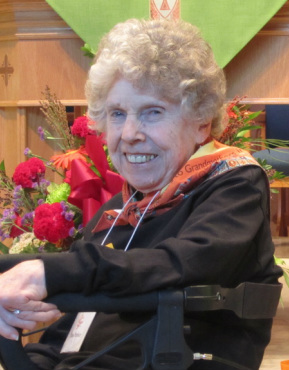 Thea Parker 1925-2014 We miss you, Thea.